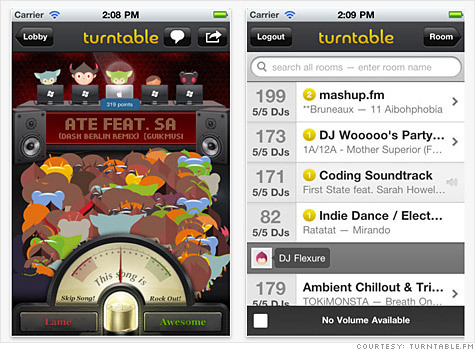 Turntable.fm's streaming music site -- released this week as an iPhone app -- lets you spin and share tunes with your friends. SAN FRANCISCO (CNNMoney) -- Turntable.fm, one of the tech scene's most-buzzed about startups, has opened its online music venue to the public. The addictive site took Silicon Valley by storm when it launched in January to a select group of invited participants. Tech insiders like Mark Zuckerberg and music celebrities flocked to the site to play with its 24/7 social streaming music service. That means they've been spending time in virtual rooms, represented by an avatar, spinning music for a crowd or listening to other virtual DJ's play songs. It was a strange concept for a music-sharing site: Everyone gets an avatar, enters a music venue, and DJs for their friends. There's also gaming element: Users who like the song click "awesome," while those who dislike the DJ's tune vote it "lame." The concept caught on quickly, with early adapters raving about it and investors -- who in the past have steered clear of music startups because of their swampy legal challenges -- throwing money their way. The site is now streaming a million songs a day at Turntable.fm, with 40% of the 600,000 people who have signed up using the service actively. "I think this really taps into something deep," co-founder Seth Goldstein said at the TechCrunch Disrupt conference in San Francisco. "People really want to experience music together." At the show Goldstein announced a $7 million funding round led by Union Square Ventures. The round also includes some non-traditional investors -- Lady Gaga's manager Troy Carter and musician Questlove, to name a few. The Turntable.fm crew released a free iPhone app on Tuesday that gives people the ability to take Turntable on the road. It's addictive and growing fast -- but is there a business model here? Not yet, but Goldstein is exploring options. "There's a number of models," he said. "There's sponsorship, virtual goods, there's affiliate fees. Today we've been very successful and lucky to have such an engaged audience. They're telling us and they're leading us towards product iterations and product development and monetization techniques." Next question: is it legal? It took another splashy new streaming music service, Spotify, years to negotiate licensing deals. Goldstein says he's in talks with all the major records, but right now, the site is operating in the gray zone. "The answer as to whether Turntable.fm is legal is not necessarily an easy answer," entertainment and new media attorney Barry Heyman said. "It's very fact-specific, and arguments can be made for either side." The Digital Millenium Copyright Act lets "non-interactive" streaming music services operate like radio stations, without striking licensing deals. That's how Pandora (P) operates, paying per-song royalties for the tracks it streams. Turntable.fm could pursue a similar path. The same labels that blasted Napster into oblivion a decade ago are now more open to the idea that digital music is invevitable and partnerships can deliver a better payoff than legal standoffs. The idea of music discovery makes the site appealing to the traditional labels, Goldstein said. If people like the music their friends play, they might, for example, one day be able to click a button and purchase it from Apple's (AAPL, Fortune 500) iTunes. That would deliver an immediate payoff to the rights-holders -- and, perhaps, the start of a business model for Turntable.fm.